Putney Bridge is another location where it is possible to reverse both C and D Stock trains. However, it is a little unusual, not only because the whole station is carried on a viaduct immediately before the bridge over the River Thames, but because, although it has a bay road, this can only be used by C Stock trains. A D Stock train will not fit - it's too long, and if a Train Operator where to inadvertently try to take one in there, it would cause serious problems! The views that I am using on this page differ from the others I've used to date in this section in that they are actually taken from a train's cab, rather than being taken from the 'ground' side, but I hope that they help to illustrate what a Train Operator is looking for when undertaking moves in such an area. Some of these pictures were taken from a train that is terminating service in the bay road at Putney Bridge during the closure of the section between Putney Bridge and Wimbledon for resignalling work, so they are taken from a C Stock. On this weekend all D Stock services were terminated at Parsons Green. 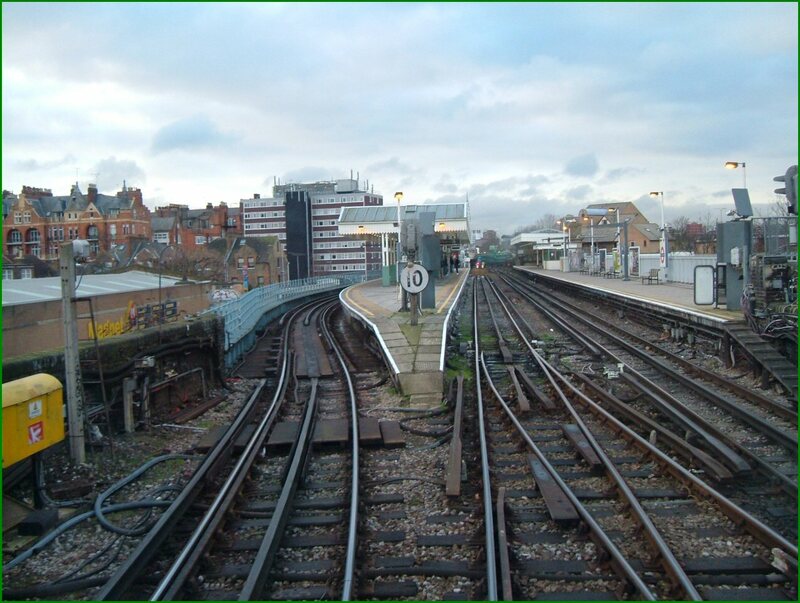 Two signalling diagrams follow - one for the area from Parsons Green towards Putney Bridge and one for the area of Putney Bridge itself, as both are relevant. As I have done on other pages the diagrams are 'clickable' to allow access to larger size versions of the diagrams. You will probably need to refer to the larger versions as I do use the signal numbers in the course of the description. Our train has left Parsons Green and is heading westbound towards Putney Bridge. For those unfamiliar with the route, the whole of the area is built on a viaduct, as I think can be seen from these photos. Some of these photos also have larger versions for clarity, and where this is the situation I have indicated this. We are about to enter the bay road, the road to the centre of the picture. There are two final measures we must negotiate which are speed controlled trainstops. These are fitted to all bay platforms to ensure that a train does reduce its speed further as it proceeds down the platform and before it reaches the end of the road which, in this case, is both a sand drag and a hydraulic buffer. Again, these work by the track 'reading' the speed of the train and, once it is satisfied that speed has been reduced adequately, these will lower. If the speed is not reduced enough, the train will be 'tripped' and the emergency brake will apply automatically. There is one final 'failsafe' in the form of a fixed (one that does not lower) trainstop right at the end of the road which will always trip the train - it is a last resort measure! Our train is now stopped in the appropriate place. The fixed red light is visible, as is the sand drag and the substantial hydraulic buffer. Visible ahead of us is the green painted structure of Putney Bridge itself. The driver will now secure the train and make his way to the east end cab in readiness to depart eastbound. Before continuing with our reversing move though, I mentioned earlier that it is possible to reverse a D Stock train at this location, and this move can be explained from the following three photos. We are now on Putney Bridge itself. The driver will have detrained his train in the normal way on the 'through' platform and will then move it forward towards East Putney. About half way across the bridge itself there are two markers between the running rails (visible in the photo) where the train will be clear of the points. The train will be stopped and secured and the driver will change ends. You will note too that just beyond the two markers is a red board, and beyond that a gap in the traction current rails. 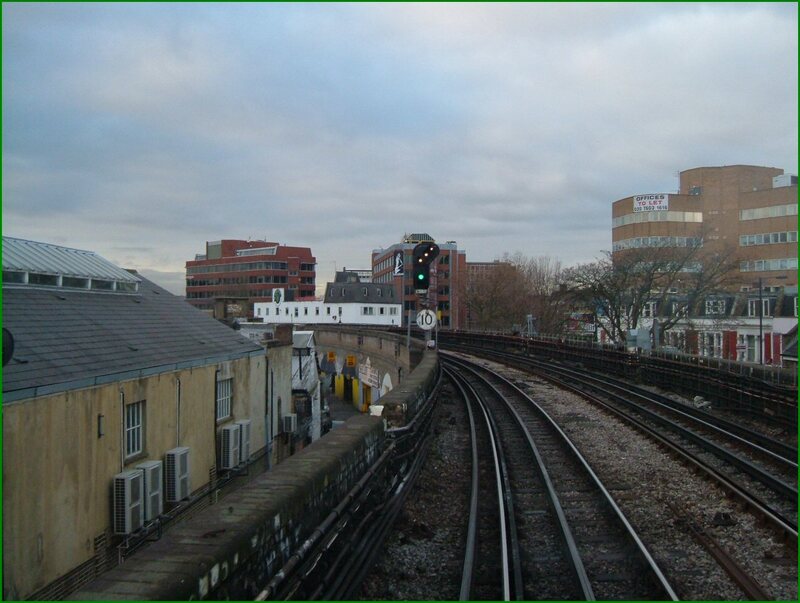 This board marks the point where traction current becomes supplied from the Network Rail system and warns drivers that beyond that point traction current should always be considered as switched on - the supply is not switched off outside traffic hours as it is on London Underground. The gap in the traction current rails is actually 48 ft long. This photo was taken from an eastbound train - if we were actually doing the move, we would, of course, be on the westbound road. The shunt signal, WG7, visible here will clear, allowing the train to be brought into the eastbound platform, where it can re-enter passenger service. Just ahead of this signal on the eastbound line is the 48 ft gap where we return to London Underground's traction current supply. This signal, WG3, is the station starter for the eastbound 'through' platform, and where our reversing move is complete and the train would re-enter service. An unusual feature of this signal though is that there is located just to the right of the mirror and monitor display is a second signal with the plate 'WG3 Co-Acting'. This has been installed as a SPAD mitigation measure. 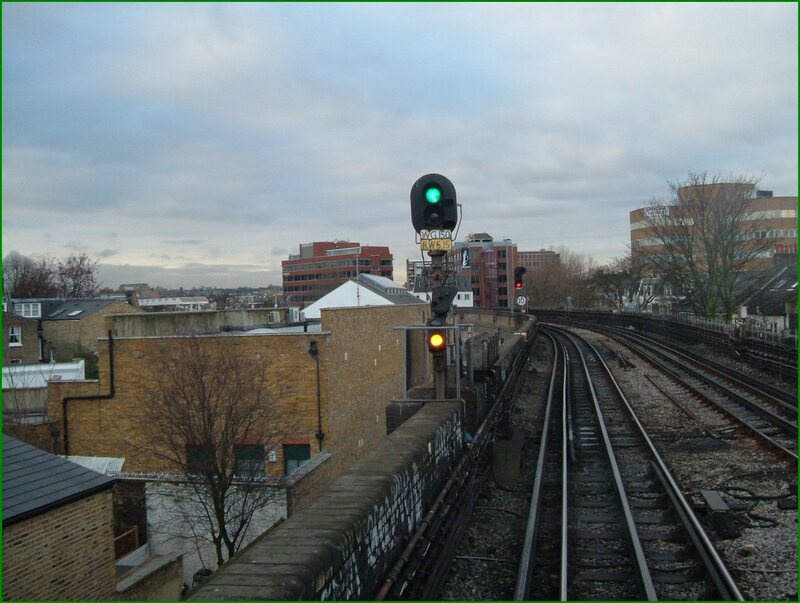 The driver's view of the 'normal' signal is a little compromised and this co-acting signal was installed to try to overcome the possibility of a driver 'starting up against' WG3 whilst it is at Danger. Also visible is the yellow sign reminding drivers of D Stock trains to lower their Weak Field flag switch. Back to our reversing move from the bay road! Having reached the east end cab, the driver will wait for the station starter for the bay road, WG4, to clear, and when it does he may proceed back eastbound. There is only one route available from this signal, and that is back to the eastbound road. This is the view the driver has as he regains the normal eastbound road as the road from the bay road and the normal through roads merge. 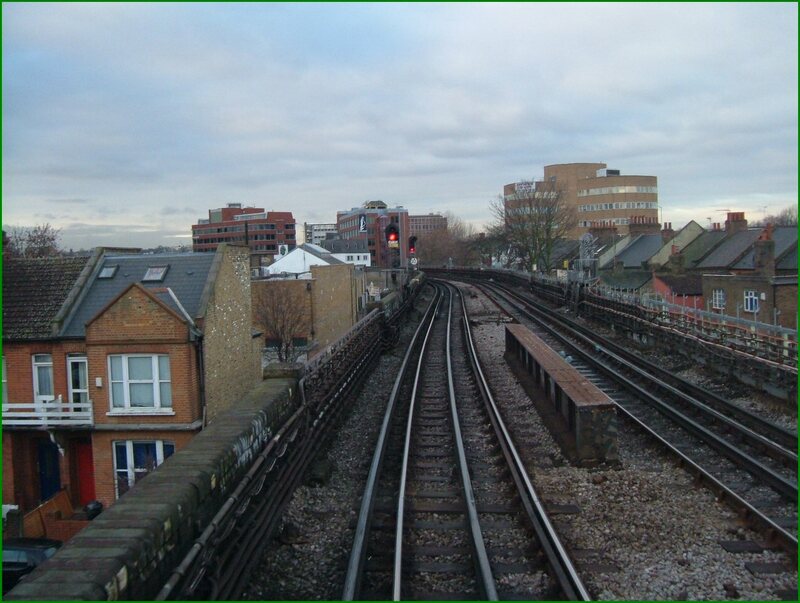 As a comparison to the first photos showing the signals and approach to the bay road, the following illustrate the more normal route into the through platform. When the route ahead of us is clear, WG150 will clear. Note that with this move, WG15 will also clear, providing the preceding train has cleared the overlap for this signal. WG15 also clears, but this time without the route indicator illuminated, indicating that the route is set for the through road. Our train now enters the through road, still subject to a 10 mph speed restriction because of the tight radius of the curve into the platform. So, that's Putney Bridge. Although it's basically quite a simple area I hope that helps you understand the options and limitations of which a Train Operator must be aware when negotiating the area, and particularly if his train is being reversed!